I've got my first finish for my Christmas in July sewing marathon. It has approximately 634 pieces. 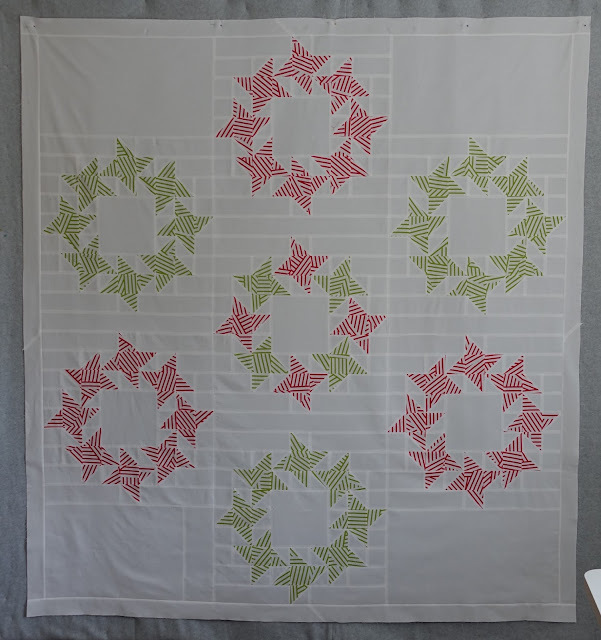 This is my second Round and Round finish, I made this quilt in December 2013, using Kate Spain Christmas fabric. I really enjoyed all the white space after my last project. Now on to the next, I'm hoping to get at least one more Christmas quilt done, two more would be better, I'm just not sure how long I'll be able to stand working with Christmas fabric this time of year. Well, that was really quick!!!! And it is just beautiful! I'm sure all of that white space will really come alive when it is quilted. I enjoy reading your blog and getting inspired with new colours and patterns. This quilt is lovely. It is a pattern I have on my list to do with Christmas fabrics also - but it won't get done as quickly as yours! Beautiful! I would love to make this one. I love this in pink and green! I bought the pattern when it came out but never thought of it as Christmas. So pretty! Love the quilt, but I think one square on the bottom is backwards. Easy fix so close to the bottom - hope you haven't quilted it yet! I love your idea of Christmas quilts! I adore this quilt. Looking forward to seeing your next Christmas quilt! Your quilt is so pretty. Do you press your seams open or to the side? With the white fabric (without the batting and backing) you can see the seams...just wondered it looks like it lies so flat. That is a very elegant quilt. I was surprised it was made with so many pieces. Good luck with getting the next 1 or 2 done. So restful yet full of movement! Yeah Thelma!